CREDITS: 2 cd's produced by Henry Small - excellent reviews home & abroad. 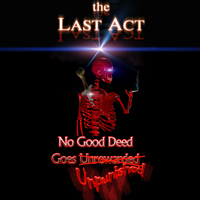 Around for some time now, The Last Act recently reformed & recorded the band's 2nd independent cd "No Good Deed Goes Unpunishihed". If you took elements of Black Sabbath, Rush, Iron Maiden, Pink Floyd & threw them in a blender, you would come close to the unique sound of The Las Act. Very melodic yet at the same time, nice & crunchy. Maximum metal Ezine says "The rock sensibility here is so perfectly done that I'm convinced that somebody in the band is a musical genius....but overall The Last Act is a class hard rock act and one of my favorite indpendent CD's for the year" Live on stage, the guys play with a passion & intensity rarely matched. Stephanie Hatte of Calgary Alberta, after just seeing them perform live says, "You guys are FU****G AWSOME!!" & more & more ringing endorsements for the band's hard rock style, are rolling in with every new performance. If you want a seriously artistic yet rockin band at your next event, be it 50 people, or 5,000 get in touch with The Last Act. Your event will most definately rock.